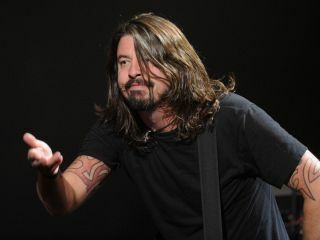 Foo Fighters to work with Butch Vig on "heaviest album yet"
Proving that he's a true multitasker, Them Crooked Vultures drummer Dave Grohl revealed that he plans to get the Foo Fighters back in the studio shortly - and a new album could be out as soon as September. Appearing at the Independent Spirit Awards last Friday, where he introduced a performance by Best Documentary subjects Anvil, Grohl, who was brandishing a bottle of Jameson Irish Whiskey, said the Foo Fighters will work with producer Butch Vig on their seventh album. "Me and [Foos drummer] Taylor [Hawkins] have already started demoing songs," Grohl told Rolling Stone. The combination of Grohl and Vig could be as much symbolic as it is sonic: the pair worked together in 1991 on Nirvana's legendary Nevermind album. But when it comes to sounds, Grohl plans on going old-school: unlike the past couple of Foos' albums, which were recorded at Studio 606 (a state-of-the-art facility that the band owns in Northridge, California), the forthcoming effort will be recorded entirely in analog - and out of Grohl's garage. "We're doing a test on Monday," Grohl said. As to the direction the band might take, Grohl simply said, "I think this could be our heaviest album yet."